Winchester and those who are avid consumers of the brand have much to celebrate in 2016 as the company celebrates 150 years of existence—150 years! It’s amazing to think about what was happening in this country the year the Winchester brand was created. To put it into perspective, think about this. Famed outlaw Butch Cassidy was born. It was in May of that year that one-time shirt manufacturer Oliver Winchester rebranded a rifle company he had bought years earlier, the New Haven Arms Company, into the Winchester Repeating Arms Company and the Winchester brand was born. Their first official product was the Model 1866 lever-action rifle, which became known as the famed Yellow Boy because of it’s yellow brass receiver. To celebrate this important milestone, Winchester will be introducing one of its most collectible sets of ammunition in history, featuring classic Winchester artwork and embossed packaging. These truly unique collectible ammunition offerings will include a 150-grain .270 Winchester load, a 150-grain .30-30 Winchester load and a hard-hitting 200-grain .44-40 Winchester load. For waterfowlers, a 12-gauge 3-inch loading of 1¼ ounces of No. 2 steel will also be available. 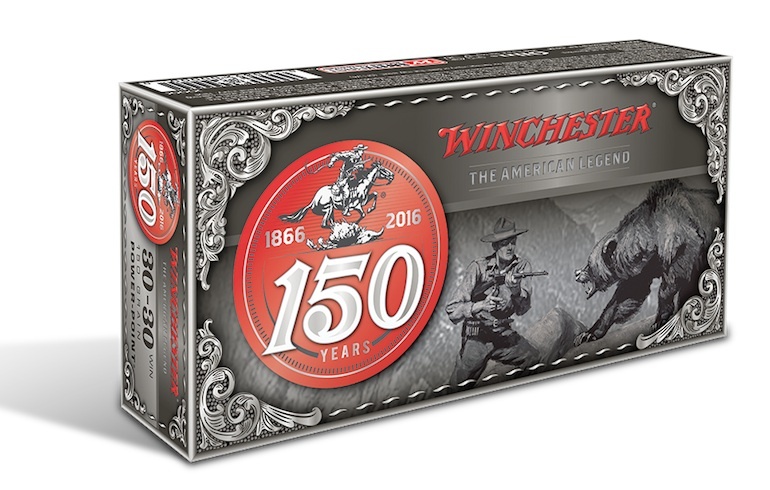 Additional Winchester Ammunition products will carry special 150th anniversary markings. Look for your favorite loads in popular calibers and gauges throughout the year. To honor the milestone, Winchester Repeating Arms Company will also be releasing a commemorative Winchester 1866 Yellow Boy lever-action rifle chambered in .44-40. The gun will feature the finest wood stock and forend and detailed engraving in the brass receiver. Look for more details on that right here as well. Winchester Ammunition will also be auctioning off five beautifully built bullet boards, which feature collectible antique Winchester firearms from the years they were introduced along with ammunition products suited to them and fit for display. Check back at Winchester.com for news on where these special items will be available for auction as well as more details on everything included. It’s going to be an exciting year at Winchester and for anyone who is a fan of the legendary brand. Check back often for more special offers and events tied to the celebration.